Cinema is one of the most effective means to promote a commodity or product, which can be a detergent, an automobile, or a big island like Kish. The ordering party can be a company or a state-run institution. Short films by famous Iranian directors about Kish were first made in mid-1990s under direct supervision of Mohsen Makhmalbaf (who lived in Iran at that time) and some of them were even screened in Cannes. Similar projects followed, the most important of which was a collection about the Iranian carpet made by different directors under supervision of Reza Mirkarimi. 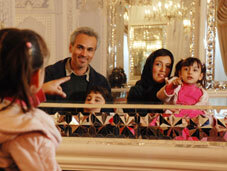 Now, Tehran Municipality has invited three directors from three generations to make films about Tehran. Dariush Mehrjui belongs to the first generation while Seifollah Dad and Mehdi Karampour represent the second and third generations. Karampour has finished the first episode called Tehran, the Last String last year, which is going through final editing. Mehrjui followed suit and made Tehran, Tehran and Seifollah Dad will start his work soon to finish the trilogy. Karampour’s film is about young members of a musical group who plan to stage a concert at a neighborhood of Tehran. Mehrjui has focused on a young poor couple who finds their humble house in ruins just before new year holidays and don’t know where to sleep the night. They come across a group of old men and women who are touring Tehran and have a good time. They join the happy group and finally rebuild their house with their help. Pantea Bahram, Qorban Najafi, Mahtaj Nojoumi, Farideh Sepah-Mansour, Akbar Meshkati, Gholamreza Nikkhah, Ali Abedini, Parviz Nouri, Sorayya Nouri, Niki Nassirian, and Fatemeh Fardin have appeared in this film most of whom are old actors of the Iranian stage and cinema. Parviz Nouri is an old film critic who has appeared alongside his wife, Sorayya Nouri. Fatemeh Fardin is sister of the greatest star in the history of the Iranian cinema, the late Mohammad Ali Fardin. Other crewmembers include Vahideh Mohammadifar (screenwriter), Ali Loqmani (director of photography), Mohammad Mokhtari (sound recordist), Ali Abedini (production designer), Farivar Moayyeri (makeup artist), and Mohammad Ali Hossein-Nejad (producer).